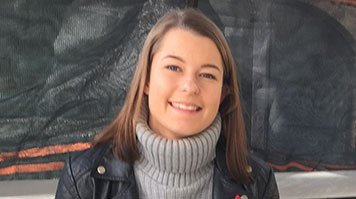 As a BSc (Hons) Bioscience student, Olivia Jayne Kemp chose to study at LSBU partly due to the support systems we have in place not only for studying, but for aspects like finance and wellbeing as well. The course allows students like Olivia to develop the understanding of scientific processes and procedures, but also allows learning to be tailored to a chosen specialism. These include food, nutrition, sport, biomechanics, psychology and forensics. Olivia has enjoyed the freedom and flexibility to decide the direction she wants her degree to take. “The fact that I would be able to choose how to shape my course in my second and third year was very appealing to me, and another reason why I ultimately decided to come to LSBU.” says Olivia. It’s a very topical issue, as the planet’s population growth continues to put pressure on resources. It’s also one that Olivia is very keen to help to tackle. “I want to contribute to the development of products and systems that help us to grow more food in the spaces that are already being used around the world,” she says. Access to the facilities at LSBU meant that Olivia is able to conduct her own experiments and record her results exactly the way she needs to in order to produce reliable results that will stand up to scrutiny. However, she feels it isn’t just the facilities that have been helpful. The lab staff and technicians have really helped me in the method for the analysis for my project. “Their knowledge and lab experience helped me to quickly set my project up and enabled it to run smoothly,” she says. In the future, Olivia hopes to carry on with researching ways to develop organic systems in agriculture. She has already been offered employment at a growing business which specialises in a related bioscience specialism, and aims to expand her knowledge further at Master’s level.